Trusted Mom Giveaway: 3 Philips Avent Natural Cups! Oh yes, another giveaway! This time is by our lovely partners from Philips Avent. I'm starting to train R to drink from a cup, the new Avent Natural Cup. He still uses his feeding bottles for water and milk (only when I'm not home). He doesn't know how to use a straw yet despite trying to sip from Achi Y's cup so many times! ﻿We're using the blue one right now and I love it! I love that it's spill proof, it trains R how to hold a cup, and you can drink from all around the rim! Galing galing! It also comes in green and red! And now for the giveaway! I'm giving away a Philips Avent Natural Cups (Blue and green cups only) to 3 lucky winners! Please use the Rafflecopter widget below or via my Apples and Dumplings Facebook Page! Contest is open nationwide! Contest will run from July 22 - July 30, 2013! Philips Avent PH will be the one to handle the delivery of the cups! Why do you want to win a sippy cup? 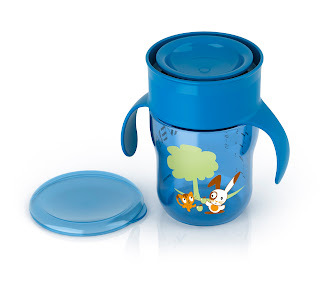 I want to win the sippy cup because I believe that it will help my daughter to drink her milk on a cup. She is already 2 years old and it is time to give up the bottle. With the cute and playful design of Philips Avent sippy cup she will be easily convince to say good bye to feeding bottle and hello to sippy cup! Who is it for? It is for my lovely daughter, Alyssa Ashley J. Namilit. I hope to win that sippy cup for my son. I want to win this Philips Avent sippy cup for Jacob, my two-year-old son! I want to win a cup for my cousin. I'm sure he definitely would love it. I want to win the cup for my son! I would like to have the sippy cup for my nephew because he is learning to drink on his own and it would be better if he has a sippy cup rather than the regular drinking glass that they use which might get broken. i want to win for my godson! :) Yahoo!!! I want to win for my 10 months old son. Aria will definitely like this! i want to win this sippy cup for my baby keane. He want to drink on his own. I want to win a sippy cup because baby Yuan is starting to eat and drink on her own and i don't want to give her any sippy cup. she is using Avent products alone because its non-colic. Cup will be for Z!! I want him to learn how to drink from a cup! My little one is turning 2 next month! It'd be perfect to start teaching him to drink from a sippy cup now. I want to win this Avent natural cup for my little hershey, as a mom I want the best for my baby and I know Philips avent provide a best product for baby. I wan to win this cup for my baby girl who just turned 6 months. As a mom I want only the best for my child, and I believe that Avent only provides the best product for babies. I love this sippy cup! It's not like the ordinary sippy cup that we see in the market that only has one spout. Regardless whether it is spill proof or not, the fact that your toddler can sip from any part of the cup's rim is great! What better way to introduce drinking from a cup than this. I want to win this cup for my tyler. He wants to hold his cup on her own like what he sees adults do. I want my baby to have this sippy cup, especially she's learning how to grab a bottle and drink by herself! Avent is my most trusted brand!